On August 31, 2018, Sun Yat-sen University, a comprehensive university in South China’s Guangdong Province with a history of more than 100 years, established a School of Agriculture, making it one of the few universities in China to offer virtually all major academic categories. Since early 2018, at least six reputable universities nationwide, including Peking University and Nanjing University in Jiangsu Province, opened agricultural colleges at a time when business, law and computer sciences were the most sought-after academic programs. As early as 2013, Deng Xingwang delivered a proposal to Peking University about the establishment of a modern agricultural school. Deng is a Fellow of the US National Academy of Sciences and a former Daniel C. Eaton Professor at Yale University, specializing in plant biology. In July 2014, he began to work for Peking University as a full professor. Deng launched several start-ups in China years ago in a bid to solve rural problems from the perspective of industry. Nevertheless, he eventually came to realize that the establishment of agricultural schools at top universities would prove to be the best solution. Yang Weicai, deputy director of the College of Advanced Agricultural Sciences under the University of the Chinese Academy of Sciences (UCAS), told NewsChina the school was established in early 2018 under the advice of Ding Zhongli, the university’s former president. In comparison with other universities, UCAS has a unique strength in its 104 institutes nationwide, offering support in research and teaching resources, including more than 20 institutes focusing on areas related to agriculture. According to Yang, its agricultural college specializes in agricultural sciences with a priority in cutting-edge topics, including smart control and advanced materials. Several agricultural experts and scholars NewsChina interviewed revealed that the fast expansion of agricultural colleges across the country reflects that the government has started to pay increased attention to the development of modern agriculture. “China faces severe challenges in preserving arable land and water resources, as well as food security. It is urgent to develop modern agriculture to solve rural problems,” Chen Yuling, Party chief of the College of Agricultural Engineering under the Nanjing-based Hohai University, told NewsChina. Among the recently established agricultural schools, Hohai University is the only one to admit students at both the undergraduate and graduate levels, as the others only admit graduate students. Deng Xingwang told our reporter that one of the problems is recruiting enough qualified staff, and it can sometimes take up to five years to enable them to start an undergraduate program. The School of Advanced Agricultural Sciences at Peking University, opened in late 2017, still has only 10 postgraduate students under the supervision of 11 professors. In addition to keeping abreast of modern agricultural development, universities established agricultural colleges so they can better pursue the title of double first-class universities. Double first-class refers to “world-class university” and “world-class discipline” – programs released by China’s Ministry of Education in September 2017 as a new impetus to develop the higher education sector. Being a double first-class university means more financial support from the government and the ability to attract more top students. China has only 42 double first-class universities and 95 universities with first-class subjects. The evaluation is conducted every five years and those who were not added to the list in the last round are squaring off to fight for the title ahead of the new round of reviews. Yang Weicai argued that under the current selection criteria, it is easier for comprehensive universities to be awarded the title of double first-class thanks to their overall strength. What’s more, many research areas related to agriculture come under the overall category of biology. “If quite a few universities compete for the ‘double first-class’ subjects of biology, the competition will be very fierce,” he told NewsChina. That is also one of the main reasons why universities have opened agricultural schools or are offering agriculture-related disciplines. According to the disciplinary development outlines on agricultural engineering at Hohai University, released in June 2018, the university’s agricultural engineering course has a clear aim – getting to the top five in China for the study of agronomy and being awarded double first-class status in five to 10 years. Chen Yuling admitted that the College of Agricultural Engineering under Hohai University was established as a major move to compete for the title of “double first-class,” adding that the university will give priority to talent recruitment, scientific research and the establishment of a leading sci-tech platform in agriculture-related subjects. During the major government reshuffle in early 2018, the Ministry of Agriculture and Rural Affairs (MARA) was established after the integration of the water resources and agriculture agencies. Chen said that previously, universities mainly cooperated in research with the Ministry of Water Resources, but after the government overhaul, universities will communicate directly with MARA, in this way hoping to gain more financial support and resources. According to a 2008 PhD dissertation by Chen Ran from Xiamen University on the development of China’s agricultural and forestry universities, Chinese society has a strong prejudice toward universities specializing in agriculture and forestry, and it has become increasingly difficult for them to attract talented students and teaching staff. Universities in agriculture-related subjects have long been largely overlooked, and they have relatively poor infrastructure and teaching resources. In the opinion of Yang Weicai, traditional agriculture teaching institutions are mainly affiliated to the sector, which maintains a long-term relationship with agriculture-related government departments. 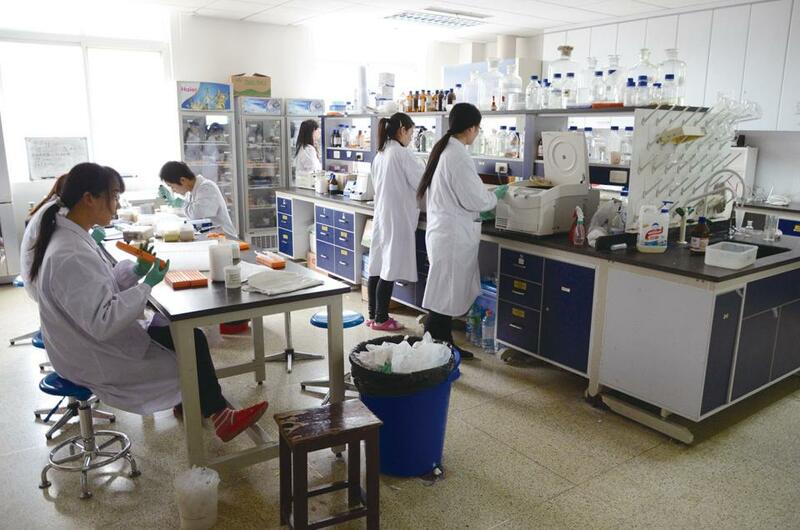 Scientific investment and input from the government largely went to research institutes, such as the Chinese Academy of Agricultural Sciences, and it has become a major challenge for the College of Advanced Agricultural Sciences under UCAS to obtain funding from the agricultural system. Yang said that during the planning stages for the agricultural school at UCAS, it was originally named the College of Future Agricultural Sciences in a bid to distinguish itself from other universities. Yang argued that the college focuses on interdisciplinary research in agriculture and the school will attach great importance to both fundamental and cutting-edge areas in the future. Deng Xingwang told our reporter that unlike many agricultural universities, Peking University has a great advantage in its multidisciplinary background of being a key comprehensive university. According to Li Qi, a professor with the Institute of Higher Education under Beijing Normal University. The establishment of agricultural colleges at comprehensive universities is a good sign. Li says that agricultural education should play a crucial role at universities. Some universities in the US, he said, developed and grew stronger on the basis of agriculture-related subjects, and it would be a great boon for Chinese agricultural development if comprehensive universities in China would attach greater importance to the sector. But Li also warned that if too many universities establish agricultural schools in haste, it would be a great waste of resources. Nowadays, virtually each province has an agricultural university and it needs discussions and detailed planning before comprehensive universities start up agricultural schools from scratch.